Ubisoft is beefing up Assassin's Creed Odyssey today with a fresh patch straight out of the oven today, which solves a bunch of bugs, introduces a New Game+ mode, and attempts to rectify the fallout created by the controversial ending of its Shadow Heritage DLC. The developer received some public flak in January, when that DLC released, after players discovered their character was forced into a heterosexual relationship to have a child and "grow up", according to the trophy/achievement attached to the immutable cutscene in question. Ubisoft has since telegraphed its intentions to address this ending, and particularly the way in which it goes against everything Assassin's Creed Odyssey supposedly stood for in the events leading up to it, and today's patch has hopefully solved the problem. In the patch notes for Update 1.1.4, the studio has confirmed it has "adjusted a cutscene and tweaked some dialogue" in Shadow Heritage's story to offer a platonic option for those who don't wish to romance Natakas/Neema, the character whom players are previously pushed into having involuntary procreation with. However, it's yet to be seen how this new ending actually plays out in-game, and whether it provides enough freedom for each player to make their own decision about their character's legacy. What also isn't clear is whether those who have already finished Shadow Heritage will be able to retroactively change their version of the story in light of the patch, or whether they'll have to play through the entire sequence again to achieve the ending they want. 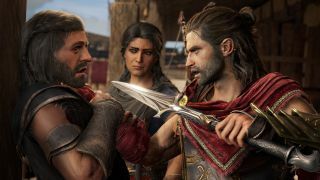 Assassin's Creed Odyssey has even more DLC expansions on the way, and Ubisoft has already promised that the continuing narrative will do a better job of ensuring "the paths that players experience mirror the choices they make in game." The final chapter in Odyssey's Legacy of the First Blade expansion is Bloodline, due to release next month, before the Atlantis story arc kicks off later in the year. Beat Assassin's Creed Odyssey? Here are all the other best RPG games to fill the gaping hole it's inevitably left in your life.